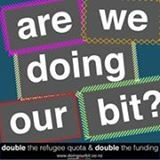 The Doing Our Bit campaign praises the coalition government for their commitment to increase the refugee quota to 1500 places. Prime Minister Jacinda Ardern had repeated their intention to double the quota on numerous occasions since the election. However, the lack of a timeframe and comments from Winston Peters, the leader of New Zealand First, had caused some speculation in the media. The campaign was founded by Stephens in 2013 with the goal of doubling the quota, which was then 750 places and had not increased since the 1980s, to 1500. The campaign became a national movement in 2015, with organisations like ActionStation and Amnesty working with Doing Our Bit to make it impossible for the previous government to ignore. Previous campaign successes include the Syrian emergency quota in 2015 and an increase of the quota to 1000 places. Decreasing migration which was one of the conditions of New Zealand First's consideration of an increased quota. Net migration numbers have fallen twelve percent from a peak of 72,400 under the previous government. Treasury predicts net migration to fall to 25,000 by 2022. Stephens released a book on the campaign in August, Doing Our Bit: the Campaign to Double the Refugee Quota. He points to three more areas which are likely to be issues in the coming term: restrictions that amount to a ban of refugees from Africa and the Middle East, which cities refugees are resettled in, and the role of New Zealand advocating for refugees on Nauru and Manus Island. Campaign to double New Zealand's refugee quota and funding. New Zealand's refugee quota has not increased since it was established in 1987. Since then our population has grown by more than a million places. The United Nations ranks us at 87th in the world for hosting refugees per capita, and this drops to 113th if we factor in GDP. On 1 July 2016 the National government will announce what the quota will be for 2016-19. Join us to tell them it is time for an increase.